Now that everything has been converted and smoothed out we can get back to the usual postings. The store is up and running and the new site is now glitch free. While all that was going down, Pete and the team worked on the final touches so we could get it back to the owner. With the car finally all together, we took it out early to lock down a shoot. First stop took us back to familiar territory. We hit the location where we shot the Apache a few weeks ago. Unfortunately the traffic was ridiculous, we shot for only a few seconds then rolled out. Fortunately I was able to secure a second driver and worked up some rolling shots! My brother tagged along allowing me to obnoxiously hang out the window in traffic. It’s one thing to see it parked, but rolling is even more epic. I’m sure most are wondering why it’s labeled as a LS2k. Well, take a guess as to what might be under the hood. A Chevrolet LS6 engine currently sits in the bay with the matching drivetrain. With such a light nimble chassis, the LS has no problem putting the power and torque down. An intake, exhaust and tune ensures the 400+hp makes it to the ground while keeping reliability. Mizner park was the second stop. The first location had too much traffic and it was extremely hard to focus. Here, it was quiet. Which allowed me to relax, shoot and also admire the car. While at the shop it was never 100% so finally seeing it all complete, clean and working as it should was impressive. With an insane wide body and huge wing nothing but small touches were needed to add some individuality. Built to function, the stance is set to allow for daily driver capabilities without the frustrations of being crazy low. Our friends over at Fifteen52 supplied us with a set of 3 Piece Bergmeisters with the proper specs to fill out the wide-body. The massive 325mm wide tires can been seen from behind. Upfront, the Wilwood big brake kit peeks through the spokes. 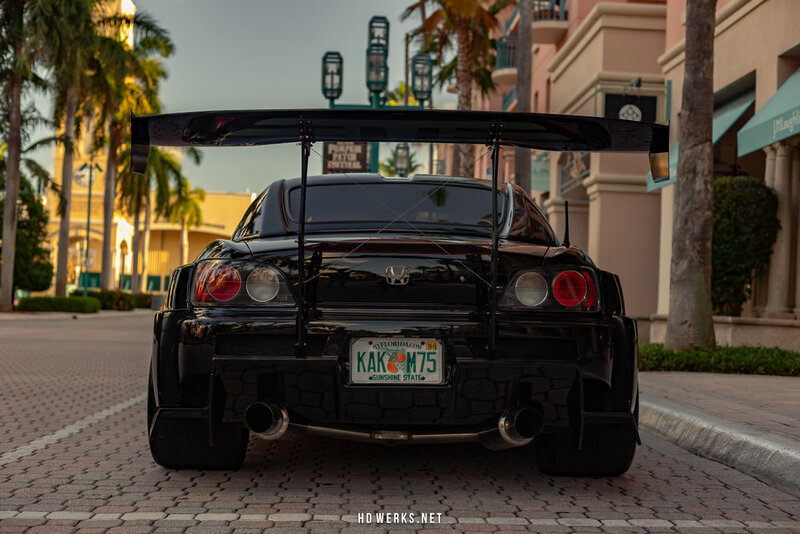 Neck breaker status achieved. Satisfied with what I captured, we hit the road again to head back to the shop. I use the opportunity to snag a few more rollers. When the car first arrived it was a hacked up mess that needed a ton of TLC. With new paint, wheels and all the kinks worked out. The LS2k turned into one seriously badass machine. I’m dropping the rest of the rollers below. Keep your eyes peeled for wallpapers and prints dropping from this set.